Portadown manager Ronnie McFall is confident the club’s demanding pre-season programme can help kick-start a competitive push for silverware. A fitness schedule designed to reduce the number of injury concerns within the senior squad opened last weekend with a first training session. The run of summer friendly games is set to start on Saturday, July 11 at home to Bangor from 2 o’clock. Both aspects have been mapped out to resolve problem areas that prevented the Ports from trophy success last season or securing European qualification. “We have Scott Paul, a former player, in as a strength-and-conditioning coach plus sessions arranged at the Club VO2 Gym,” said McFall. “It is about utilising whatever resources possible and the players have returned from the summer break in great shape. “The variety of games and opponents will test us in a number of different ways. “It is all about giving as many players as possible minutes on the pitch. “Chris Casement had a small foot operation during the summer so is working back to full fitness, however, everyone else is free from injury. Other pre-season friendlies: Friday, July 17: Stranraer (home, 7.45); Saturday, July 18: Newry City (away); Tuesday, July 21: Banbridge Town (away); Thursday, July 23: Lurgan Celtic (home, 7.45); Saturday, July 25: Harland and Wolff Welders (home, 3 o’clock); Saturday, August 1: Annagh United (away). AUGUST: 08 - Crusaders (a); 12 - Warrenpoint Town (h); 15 - Cliftonville (h); 22 - Ballinamallard United (a); 29 - Linfield (a). SEPTEMBER: 05 - Glenavon (h); 12 - Glentoran (a); 19 - Dungannon Swifts (h); 26 - Coleraine (h). OCTOBER: 03 - Carrick Rangers (a); 10 - Ballymena United (h); 17 - Cliftonville (a); 24 - Ballinamallard United (h); 31 - Crusaders (h). NOVEMBER: 07 - Coleraine (a); 14 - Carrick Rangers (h); 21 - Ballymena United (a); 28 - Linfield (h). DECEMBER: 05 - Warrenpoint Town (a); 12 - Glentoran (h); 19 - Dungannon Swifts (a); 26 - Glenavon (a). 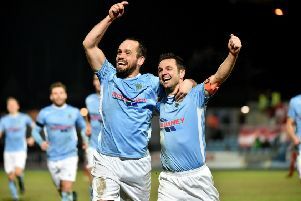 JANUARY: 01 - Ballymena United (h); 16 - Ballinamallard United (a); 23 - Crusaders (h); 30 - Cliftonville (a). FEBRUARY: 12 - Linfield (h); 20 - Glenavon (a); 27 - Carrick Rangers (h). MARCH: 12 - Coleraine (h); 19 - Glentoran (a); 26 - Warrenpoint Town (h); 29 - Dungannon Swifts (a).